and small intestine and the lungs and large intestine. These pairings are not recognised in Western Medicine. 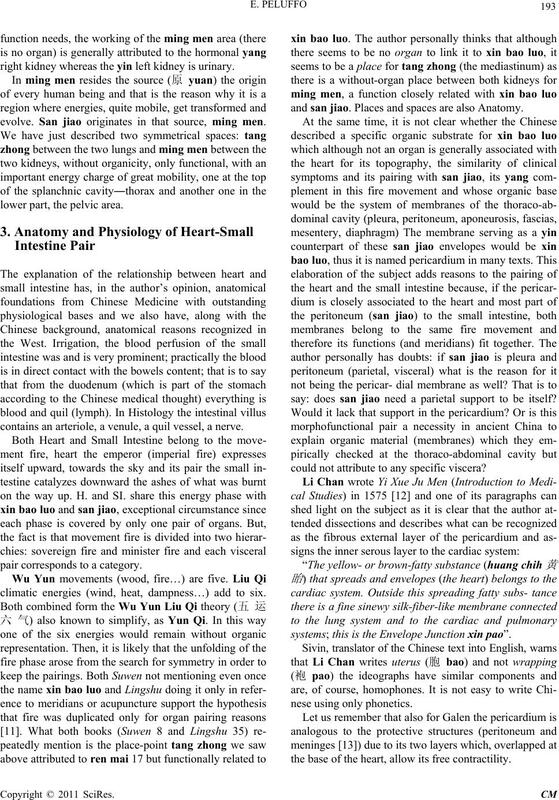 criptions which, nevertheless, do not admit the functional-organic coupling of the heart and small intestine. (腑fu) of transmition and drainage of this surplus. which surrounds the heart (心 包 络 xin bao luo). tiniest corners of the organism through its circulation. 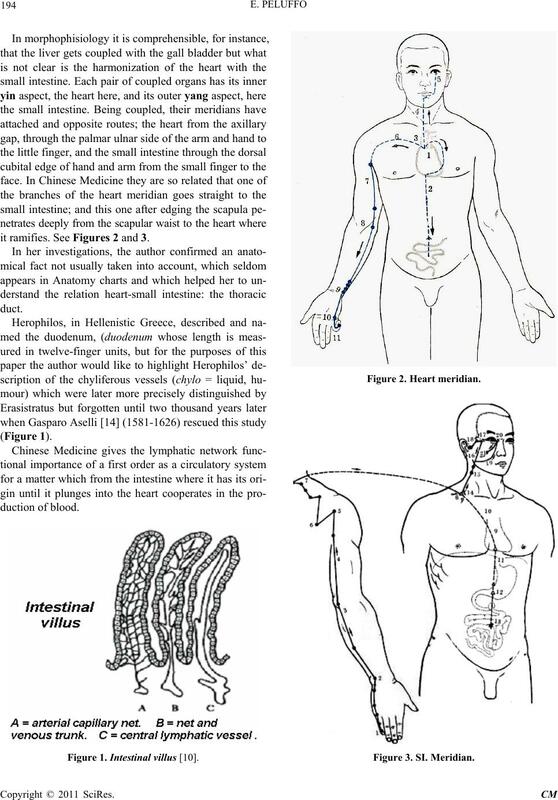 tions produced in the interior of the body. suggest a membrane (pericardial, endocardial, pleural). by which the heart commands. translation to our European languages. sovereign fire (君 火 jun huo) . tween the two kidneys where the ancestral energy moves. right kidney whereas the yin left kidney is urinary. evolve. 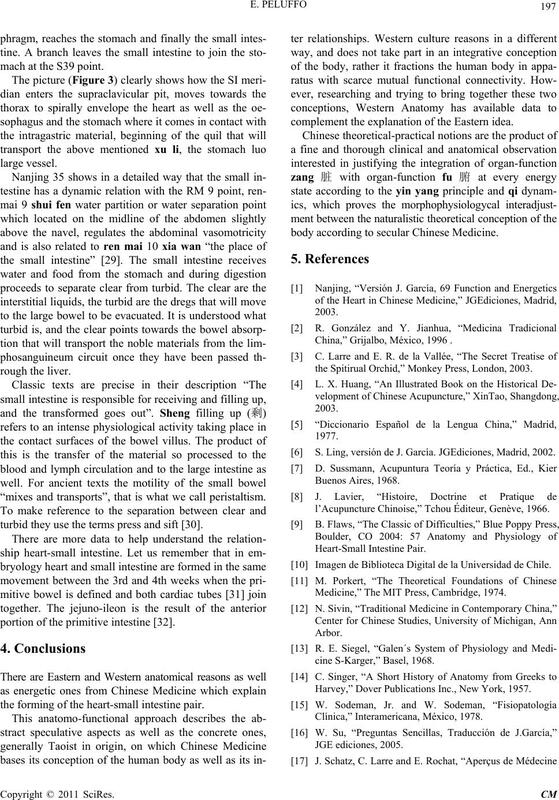 San jiao originates in that source, ming men. lower part, the pelvic area. contains an arteriole, a venule, a quil vessel, a nerve. pair corresponds to a category. climatic energies (wind, heat, dampness…) add to six. and san jiao. Places and spaces are also Anatomy. say: does san jiao need a parietal support to be itself? could not attribute to any specific viscera? systems; this is the Envelope Junction xin pao”. the base of the heart, allow its free contractility. it ramifies. See Figures 2 and 3. Figure 1. Intestinal villus . 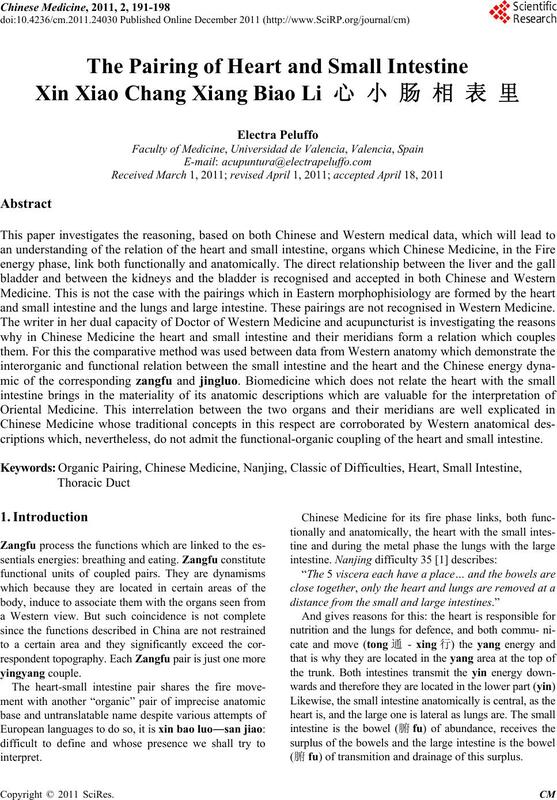 cestral energy, can be felt (zong qi)” . idea of the thoracic duct as an actual organ. ished both of them to deduce their respective functions. turning backwards, it rests on th e navel”. holds the Pecquet’s cistern . would point to the practice of dissections. Figure 5. Small intestine and “Wide” intestine . in the small intestine which is spirally enveloped by it. 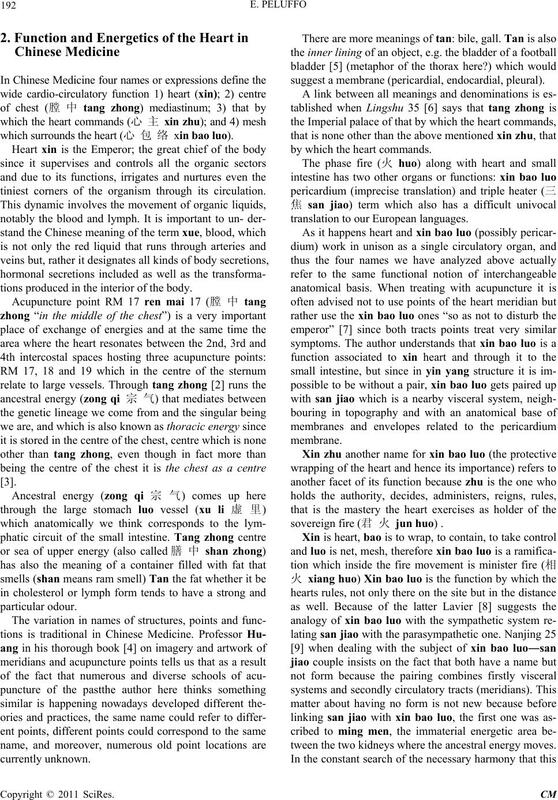 into the axilla in whose pit lies jiquan the first point H1. coincide with the angina pectoris clinics. at the tip of the tongue, in the speech. mach at the S39 point. “mixes and transports”, that is what we call peristaltism. turbid they use the terms press and sift . portion of the primitive intestine . 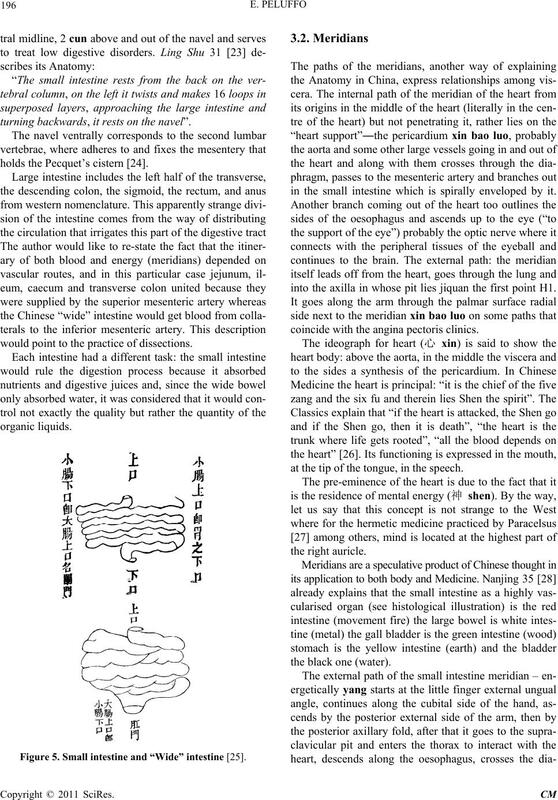 the forming of the heart-small intestine pair. complement the explanation of the Eastern idea. 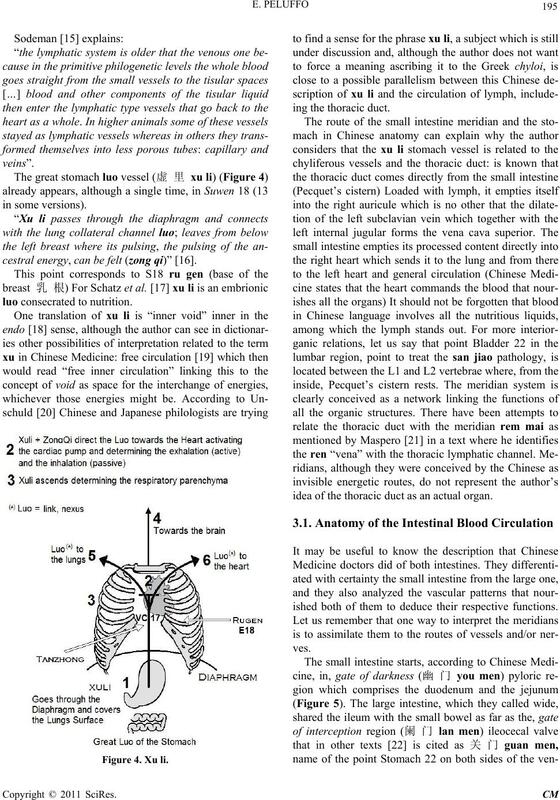 body according to secular Chinese Medicine. China,” Grijalbo, México, 1996 .
the Spitirual Orchid,” Monkey Press, London, 2003. S. Ling, versión de J. García. 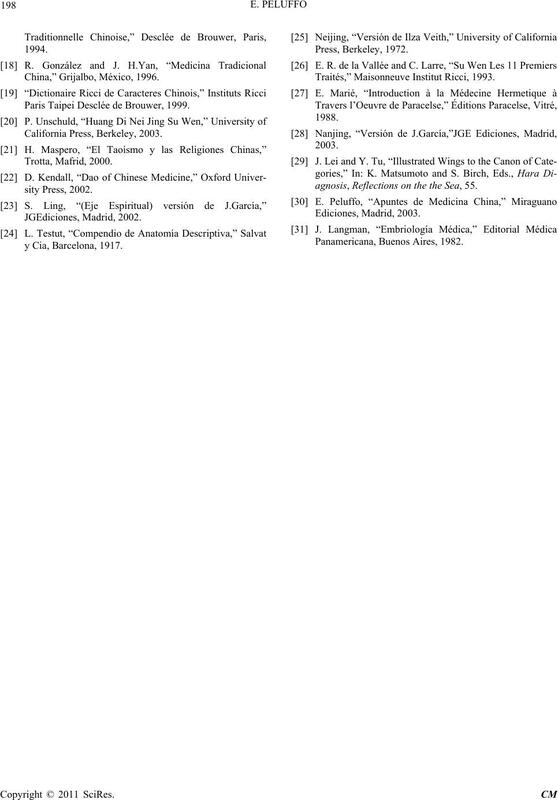 JGEdiciones, Madrid, 2002.
l’Acupuncture Chinoise,” Tchou Éditeur, Genève, 1966. Imagen de Biblioteca Digital de la Universidad de Chile. Medicine,” The MIT Press, Cambridge, 1974. Harvey,” Dover Publications Inc., New York, 1957. Paris Taipei Desclée de Brouwer, 1999. Traités,” Maisonneuve Institut Ricci, 1993.
agnosis, Reflections on the the Sea, 55.